I tried reading this book once before, in the beginning of 2014. I couldn’t get past the first page. It just wasn’t my cup of tea then. Trying it again a year later, well it was good. But not the best book I’ve ever read. That’s for sure. Let’s start off with Cassie. In the start of the book she is really likeable and more of a “I won’t take any crap.” kind of girl. Which was great! It’s what an alien book needs! I mean hell. The last one that was huge (The Host) just was NOT that…powerful. After she gets shot at and almost dies, and meets Evan, she becomes a typical teenage girl that totally has Stockholm Syndrome, even though she isn’t technically a hostage she might as well be one. She keeps telling Evan that they have to go find her brother and he tells her “No, you have to get better first.” Which isn’t a lie. But she is still being held there against her will. Going into this book, even though it’s a Young Adult, I didn’t expect much romantic stuff. And honestly, for an alien takeover book. There was just far to much. Now let’s talk about Ben/Zombie. Cool. He survived the plague thing. Cool, he got into the Army thing even though he was technically too old. Cool they turned him into an alien killing machine. Cool…kids as old as 7 get to go murder people because the military tells them they are aliens. Oh wait. That’s less cool. It takes a while for them to pass and get to their first mission. But that stuff isn’t really as important. Well, maybe the fact Cassie’s younger brother is in Ben’s squad. And Cassie totally was in love with Zombie B.A. (Before Aliens). And that this one guy went crazy in the squad and tried to kill people. But that’s about it. Oh. And this new girl that showed up. Ringer. She’s important too. Anyways. On their first mission out, Zombie and Ringer figure out that these trackers that were put in their necks on the first day at the bootcamp are really these things that…well I don’t know what they do. But they make it so they don’t glow green in the glasses the Army gave to them to figure out which people are the Aliens or not. So they remove theirs. And everyone else in their squads except one guy. Ben ends up going back to the bootcamp to save Nugget/Cassie’s brother. They escape. More important things happen. But that’s basically the end of the book. I am patiently awaiting the second book to be in stores near me. I really did enjoy certain parts of the book, the parts without the romantic stuff mostly. I enjoyed making theories about what is going on. Who is and who isn’t really the Aliens. I do recommend this book to…well everyone that likes to read this kind of stuff. 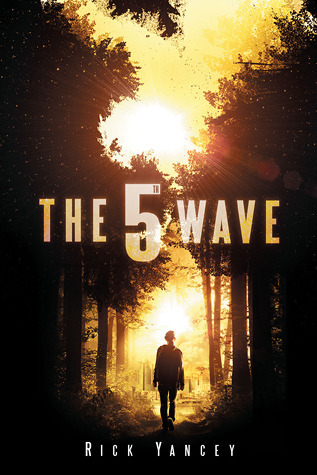 This entry was posted in Book, Book Review and tagged adult, author, book, book review, book reviewer, book tag, books, review, reviewer, rick yancey, the 5th wave, young, young adult. Bookmark the permalink.